No one thought anything of it—they assumed she fell. How many times had we counted those steps? She took the odd numbers; I, the even. I had fewer steps. She always came out ahead. I often stayed at the base while she peered over the edge from the top. 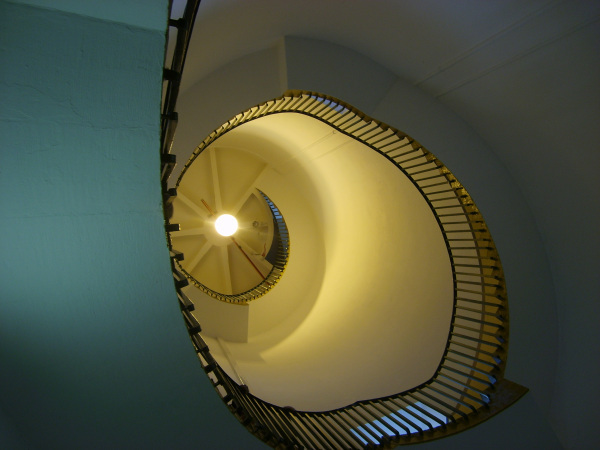 The stairs spiraled inward, upward, like a nautilus. My own face stared down at me, smiling. I never looked down on her, never had that vantage. Just the one time. I couldn’t see her face. Only the tangle of hair and limbs and blood, like rough red algae washed ashore. This entry was tagged fiction, flash fiction, friday fictioneers, microfiction, postaday, story, storytelling, writing. Bookmark the permalink. Brutal and tense – well done. This is a horrifying story, of course — which is a compliment — but that final image is just gorgeous and apt. A horrible ending to his wife. However the story is well written. This is brutal, especially the “I never looked down on her, never had that vantage.” Intense, and especially the end. Very well crafted. Sounds like twins to me, one perceiving the other as “good” while she’s never as good. I like the nautilus comparison and “like rough red algae washed ashore” especially. Sustained, intense applause for your perfect peice. When I first read it I ‘saw’ two girl friends and never looked back. Reading janet’s comments and your reply i see twins now but either way, it is a powerful, wonderful, compelling story. So well done. You have vaulted into the upper echelone of the FF tale tellers with this one. Thank you so much for your kind words, Doug! you had a perfect flow here, and a compelling story. I didn’t catch the twins, but now it seems so obvious. That was a well crafted story. sometimes the words just pull the reader along. That’s the best of writing. You hit that here. you are very kind. thanks for reading! I did see the twins in this. You raised the bar on sibling rivalry. Staring at my own face. Stunning, strong and subtle all at the same time. Good job! Hi Flossie. I really enjoyed this story. I love how you start with the end and then circle back to it, much like the photo in a way. To me, great writing is in the details – you have crafted so much into this story, that I feel as though i know both these characters and their lifestory already. I don’t get to read everyone every week; you’ve made that worthwhile this time!